Good morning, Eagles fans. Finally, after a two-week wait, there's football in Philadelphia. The Eagles will host their first playoff game since January 2014 on Saturday afternoon. If they win, they play again next Sunday. If they lose, the season's finished. The beat writers are split on their predictions; what do you think will happen? This is a Friday edition of the Early Birds newsletter. We'll have a special postgame edition on Sunday. It's free for anyone to sign up here to receive in your inbox every weekday. I want to know what you think, what we should add, and what you want to read, so send me feedback by email or on Twitter @ZBerm. Thank you for reading. Can the defense carry the Eagles? : The Eagles aren't likely to win a shootout. The defense must carry them. It's a defense that excels at home – opponents are scoring only 13.4 points per game at Lincoln Financial Field – and bullied the Falcons last season. It's a different year, but this is a better Eagles defense. The magic number for the Falcons is 20. The Falcons are undefeated when they score at least 20 points and winless when they score fewer than 20 points. It'll be tough to keep them below 20 – I think Julio Jones is the best wide receiver in the NFL, Matt Ryan is the reigning MVP, and they have a formidable running back duo. But the Eagles can win at the line of scrimmage, and that's the equalizer. Fletcher Cox is the highest-paid player on the Eagles and needs to play like an All-Pro on Saturday. You saw what Aaron Donald did in the Rams-Falcons game last week. Cox can have that type of influence on this game. 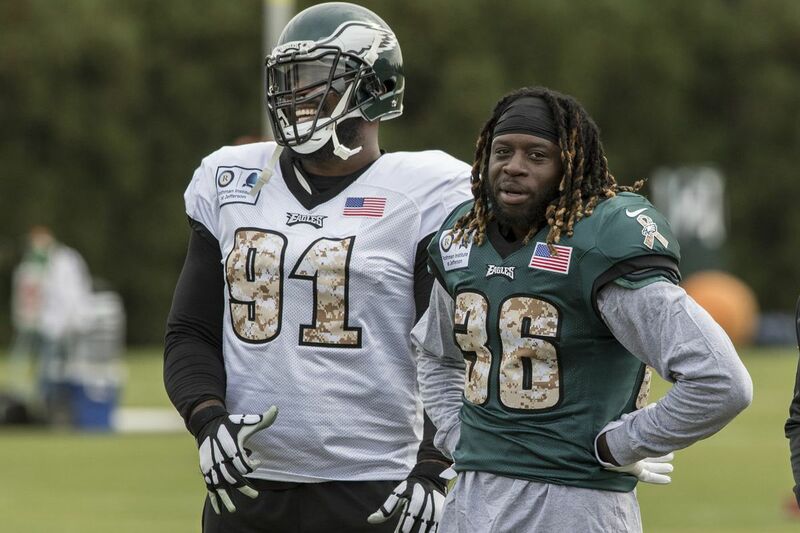 If the Eagles win, the defensive line will be a big reason why. How many carries for Jay Ajayi? : The Eagles know they need to run the ball, but are they going to ride the Jay Train? In Doug Pederson's two seasons with the Eagles, a running back has 20 carries only twice in 32 games – and never this season. Pederson likes to spread carries around and he hasn't indicated that he wants to depart from that approach with his running backs. But it would be wise to feature Ajayi, who should be fresh after being held out Week 17 and benefiting from the first-round bye. Add those two weeks with a Dolphins bye week and an Eagles bye week during the regular season, and Ajayi has had four weeks off. He's the most talented running back on the roster. They should treat him like it. Ajayi can carry a big load – he has nine career games with at least 20 carries. That includes the Oct. 15 performance over the Falcons when he had 26 carries for 130 yards. Which Nick? : The biggest problem with Nick Foles is that you never know which Foles will show up – there's such a high variance to his play. He's better than his reputation in this city right now. There's recency bias because of his last five quarters, but if you've watched Foles long enough, you know there's been a five-quarter stretch on the other end of the spectrum. Consider this: In Foles' career, he's had 14 starts with a passer rating better than 100 and 16 starts with a passer rating lower than 80. He's had only nine starts in between. The Eagles need the good Foles on Saturday. How do they start? : The Eagles have essentially had a three-week layoff if you include the season finale when the starters barely played. That's a long time between meaningful games. The last two times the Eagles had long breaks were after the Thursday night game in October and the bye week in November. The Eagles trailed at halftime in the first game following both those layoffs before dominating opponents in the second half. Pederson attributed the sluggish starts to the breaks in the schedule. The Eagles can't afford a lackluster start against the Falcons, and Pederson knows it. "Practicing last week helps," Pederson said. "I shouldn't have to say anything for this game, you know what I mean? The energy level, the juices will be flowing. It's been a couple weeks since we've been on the field. It's a different feel. I have no doubt our guys will be ready to go." Who's better on third down? : Situational football is important every week, but it's especially important in close playoff games. The Falcons had the best third-down offense in the NFL this year, converting on 44.7 percent of their attempts. They were 2 of 11 against the Eagles in 2016 with an average distance of 9.9 yards to go. The Eagles need to force negative plays on early downs to get the Falcons in third-and-long situations. Conversely, the Eagles ranked eighth in the NFL in third-down offense with a 41.7 percent conversion rate. But they went 3 of the 25 in the last two games, and they were 45.4 percent entering Week 16 – a mark that would be No. 1 in the NFL. The Falcons are 38.3 percent in third-down defense. Sustaining drives will be critical for both scoring and field position. The Eagles will play in London in October, Jeff McLane writes. It's a homecoming for Jay Ajayi, Les Bowen writes. Speaking of homecomings, Matt Ryan spoke with Bob Brookover about coming to Philadelphia this weekend and the Falcons' season. The beat writers are split on the Eagles-Falcons game. Sidney Jones and Dannell Ellerbe are questionable for Saturday's game. How can the Eagles offense beat the Falcons? McLane breaks down the film. Will the playoffs be an annual trip for the Eagles? Paul Domowitch writes about the sustainability of this team. You've heard about the Eagles' playoff experience. What about the veterans who haven't been there? They appreciate Saturday perhaps more than anyone. Doug Pederson has taken an edgier tone leading to the postseason game, Mike Sielski writes. Marcus Hayes says it's time to believe in the Eagles. If Nick Foles is confident, McLane says Foles will throw downfield. Bob Ford's exchange with an Atlanta columnist will make you laugh and think. Ford also wrote about Foles on third downs. David Murphy tracked down Pederson's old coaching foe from the high school ranks. Murphy also spoke with Jeff Garcia, who was the last Eagles quarterback to win a playoff game in Philadelphia. Former Eagles defensive end Hugh Douglas is a radio host in Atlanta — and still supports the Eagles, Bowen writes. What will the temperature be on Saturday? Anthony Wood has the latest. If you missed the Thursday newsletter, it looked at Alshon Jeffery's connection with Foles. Zach Berman: What clicked for you when playing the Falcons earlier this season? Can that be a resource for this game? Jay Ajayi: "Just running hard. That was our plan. We knew we were going against a good defense. Attack them with the run game, stay with it throughout the game, and it was a good game. …You watch the film. Obviously, it's a different scheme. But definitely some good things you can watch in that film that we can use." Zach Berman: What's the background of the "Jay Train" nickname? Jay Ajayi: "'Jay Train' started at Boise State. I was a redshirt sophomore and I was starting, looking for that alter-ego on the field to go to, that persona to take my game to the next level. I'd seen a picture, someone Photoshopped me on a train. I thought it was kind of clever. I've stuck with the Jay Train celebration when I scored. It became my persona on the field where I'm kind of a nice guy off the field, real chill. When I'm on the field, I can turn into the Jay Train, become kind of violent, physical. I always say, it's almost like you can be violent on the field and it's legal a little bit because it's football. That's kind of where I can go with that persona and use it to be physical, to be a dog on the field. Use all those emotions to run and make plays for the team." Zach Berman: Other players have an alter-ego. Brian Dawkins had it in Philadelphia. Is that important to transform into something else on the field? Jay Ajayi: "I think certain guys, it's just like that. You've been seeing this videos that we've been putting out this week with Dawk. Those videos are intense. You kind of see that 'Weapon X' alter-ego in those videos. When you speak to B-Dawk around the building, he's a calm, cool guy you can talk to. But that's not the same guy on those videos. That guy, he'll take anyone's head off. It doesn't matter who it is. That's Weapon X in those videos. Some guys, you kind of get in your zone where everything is instinct and you're out there, emotions, you're just playing football. For me, it's being the Jay Train. I use that and it's been great for me. I just go into an ultra-competitive mode, where it's like I'll get mad at my own mom if she was out there. It's just how I am, I guess. You get in that ultra-competitive mode and you just want to do everything you can to succeed." Good question. So you mean other than the obvious of Jay Ajayi and Fletcher Cox, like I mentioned above, and Lane Johnson and Nick Foles, who both have been written about often this week? Here's one: Malcolm Jenkins. Go back and watch the Falcons game last year, and he starred. It was as well as he played since he's been with the Eagles. He was credited with six tackles and a tackle for a loss, but he was all over the field and was menace on third downs. Jenkins' versatility has been underrated this season; he's played better against the run this year than in past seasons, and my guess is he's used in that all-around role again on Saturday. He'll help against Julio Jones on one play and square up against Devonta Freeman on the next. Jenkins is the Eagles' vocal leader, but don't overlook how important he is on the field. That's a little on the high side, but I can see it being 55-45 in favor of the run. In their best running games (Chargers, Broncos, first Cowboys game), they weren't 60-40. It was usually in the mid 50s. Nick Foles is going to have to throw the ball and challenge the Falcons even if the run game is the priority. He needs to make plays, there's no getting around that. If they're in the 52-58 percent range for running the ball, that would make sense. If they're favoring the pass, it's either because they're trailing early or Doug Pederson was too aggressive. Will Dawkins come through the tunnel once again to get the Linc going nuts? That's a good suggestion. Brian Dawkins is the most popular player I've seen in this city, and I can only imagine what that would do to the crowd. But Dawkins hasn't taken a large public profile since joining the team's front office. I'd be surprised if they use him that way; my guess is the Eagles make the current players the attraction, although I really don't know what they have planned pregame. However, Jenkins does a good Dawkins impression.